Harmen van Sprang and Pieter van de Glind are leading experts in the collaborative (sharing) economy. They have given many lectures, workshops and strategy sessions, and are asked to participate in discussion panels around the world. In 2013, they co-founded shareNL, the Dutch knowledge and networking platform to further develop the collaborative economy. The growing and dedicated shareNL team works with start-ups, corporations, cities, governments and knowledge institutions from around the world. 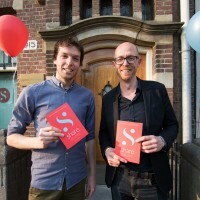 The company initiated the Amsterdam Sharing City project and co-founded the Sharing Week. At the beginning of 2016, Van Sprang and Van de Glind authored the book Share: opportunities and challenges of the collaborative economy.